Pure 100% Big Island Grown Kona Prime. A medium grade full city roast richly aromatic coffee with bright flavor characteristics, reflecting the romance of the Islands. Sealed in a foil bag to retain freshness! Maui Oma uses top of the line roasting equipment and works directly with small farmers from Kona to Maui to Kau and throughout the Hawaiian Islands to secure some of the World's Best Coffees! 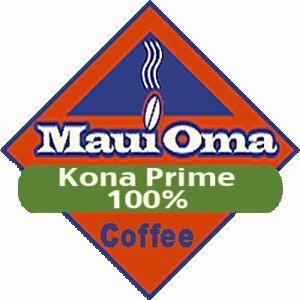 This quality makes Maui Oma Coffee some of the Freshest, Fullest, Most Aromatic, Most Alluring coffee around! Pure 100% Big Island Grown Kona Prime. A medium grade full city roast richly aromatic coffee with bright flavor characteristics, reflecting the romance of the Islands. Sealed in a foil bag to retain freshness! Maui Oma uses top of the line roasting equipment and works directly with small farmers from Kona to Maui to Ka'u and throughout the Hawaiian Islands to secure some of the World's Best Coffees! This quality makes Maui Oma Coffee some of the Freshest, Fullest, Most Aromatic, Most Alluring coffee around! Order some for the next holiday or special party. If you have any questions about this product by Maui Oma Coffee, contact us by completing and submitting the form below. If you are looking for a specif part number, please include it with your message.